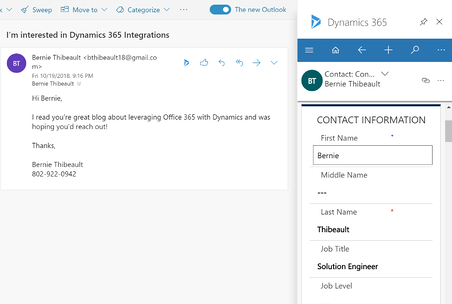 These days, every CRM system needs to integrate directly with Outlook – and none do it better than the Dynamics App for Outlook. You can work in Outlook all day and have complete access to the full functionality of Dynamics without skipping a beat. If you have emails coming in from leads all day, Dynamics 365 will know their data without your input and you can update their information right from the Dynamics 365 side panel. Turning on email tracking will also allow any emails sent to/from records in Dynamics to be tracked to its timeline. Microsoft is pushing Artificial Intelligence very hard. 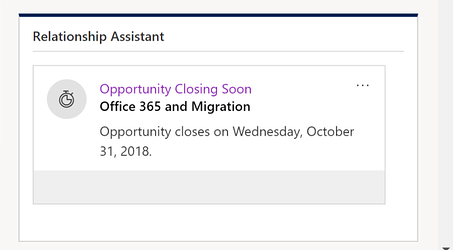 And one of the main places they are pushing it is in Dynamics 365. The relationship assistant monitors daily actions like tasks, sentiment in emails and opportunities nearing their close date to provide you with actionable insights. 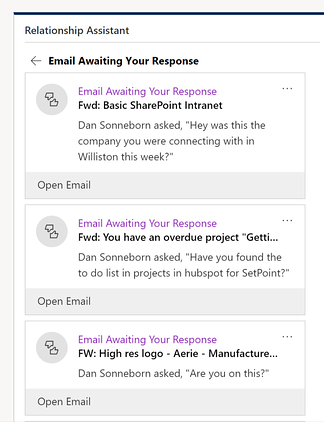 Data cards show up in your dashboards and on forms to give you friendly reminders to send the client that email or follow up on that opportunity. Just look at this list of AI features rolling out in the October ’18 releases here. AI is going to give you everything you need to have a leg up on the competition and close more deals. SharePoint is another powerful tool that you should leverage with your Dynamics implementation. Every business uses documents and needs a place to store them. With the SharePoint integration, you can link those documents to a quote, opportunity or any record you choose, and it can all be surfaced in SharePoint, along with all the functionality you get with it, such as versioning and workflows. By enabling the OneDrive integration, you can manage and work on documents from Dynamics 365 and have them automatically synced to your desktop or mobile device. Go with OneDrive if you want a more private file management solution. The integration with Excel allows for data export/import, creating templates, and being able to refresh or edit Dynamics data directly from Excel using Dynamics worksheets. 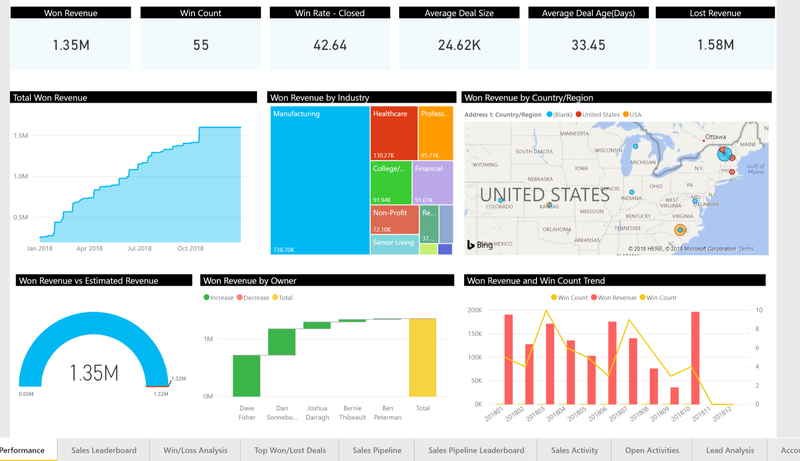 PowerBI is a no-brainer when it comes to business analytics and interactive reports. Create powerful visualizations with your Dynamics data and embed it right into the D365 dashboards. You can also share these reports with non-Dynamics users. For every record in Dynamics, you can keep a OneNote notebook to store notes, pictures, videos or voice recordings. This enables your employees to collaborate on the sales deal or project in one of the best productivity tools that Microsoft has to offer. With this integration, you can create or link O365 groups to Dynamics 365 records. This gives you a way to link emails, conversations files and collaborations to a record. This is great for projects or big sales opportunities that may involve several users that need a place to collaborate. Dynamics allows you to click on any phone number in the system to automatically open your Skype for Business account and give them a call. This is a great tool for sales people who are constantly calling their contacts, lead and opportunities that don’t want to worry about managing contacts and phone numbers. Dynamics 365 is a powerful platform on its own, but when you can leverage the functionality available in all the other Office 365 applications it cannot be beat. Combining the two will bring your organizations productivity to another level. If you’re interested in learning more or need help setting these integrations up, please comment or contact me at bthibeault@aerieconsulting.com.